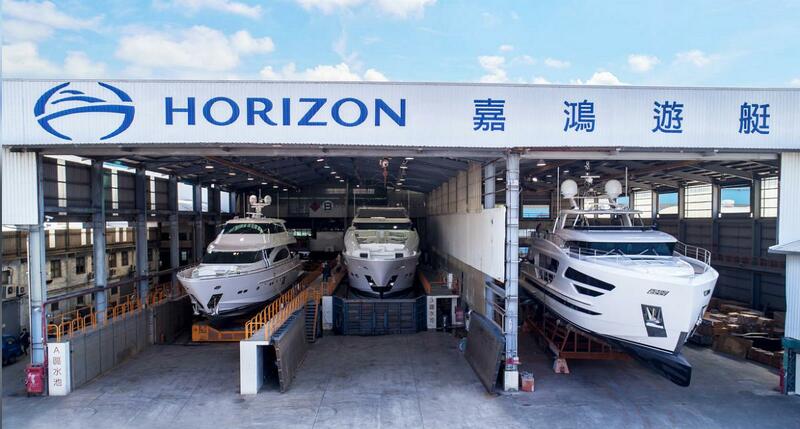 After a successful 2017 year, Horizon Yachts continues to thrive with increased orders in the first two quarters in 2018 and a total of seven luxury yacht deliveries, three of which are over 80 feet in length. Additionally 18 luxury yachts are currently in build and will be delivered to their owners between the remainder of 2018 and the first half of 2019. Three deliveries that took place in the first half year were for two FD87 Skyline and one FD85 motoryachts, showcasing the popularity of the designs. The FD series is known for its contemporary style lines, flexible cruising speeds, and spacious interior volume, which has attracted the attention of many seasoned owners and resulted in new build orders. By the second quarter of 2019, an additional four FD models – three FD87’s and one FD85, will be delivering to the American, Australian, and European markets. Moreover, another new model of FD series, FD77, is being built, and will make her debut in the first quarter of 2019. As for Horizon models under 80 feet, four yachts that completed the first half year include hull one of the new V68 motoryacht and PC52 and PC60 power catamaran models. The V68 with her “superyacht attitude” was extremely well received during her debut in the U.S. earlier this year, and Horizon received increased enquiries as a result. This year also marks the 10th anniversary of Horizon’s V series, and the company will deliver a new V81 this summer to her new owner – a fitting way to celebrate! In the next few months, four new PC series builds – including the newest PC65 model – will be delivered to her owners in the U.S. for blue-water cruising. An exciting new build order for the CC115 superyacht will be finishing in the third quarter. This CC115 is a customized raised pilothouse that was designed in collaboration with Cor D. Rover (the designer of the FD series). These experienced owners loved the Horizon RP models but wanted something a little bit different; working with Horizon and Cor, the owners outfitted their superyacht with a Portuguese bridge around the bridge deck and innovative features aimed at the owners very specific use requirements with family and friends. This new CC115 is currently in dry dock testing stage, with completion scheduled in September. Last but certainly not least, two E series models will deliver in the third and fourth quarters – one E88 for the U.S. market in July and one E75 for the Australian market in November. Additionally in the spring of 2019, another E75 will be delivered to her Australian owners, and an E98 motoryacht will be completed in July of next year. Designed by John Lindblom, these models are established and popular with various global markets thanks to their sleek design, flexible layout options, and myriad of amenities. For more information on Horizon’s latest activity, please contact us at 561-721-4850 or sales@horizonyachtusa.com.